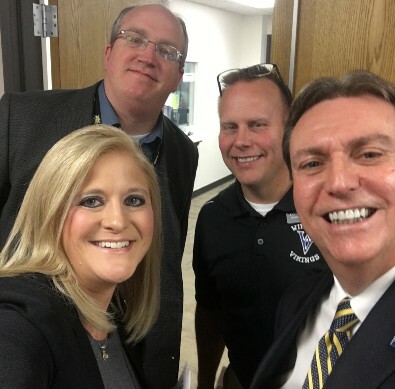 Principals Jeff Everett, Dave Hammer, Desaree' Groene, & Kansas Commissioner of Education Randy Watson. (TOPEKA 4/18/18) — Nineteen school districts from across the state will take part in Gemini II: The Space Walk Begins, which is the next round of the Kansans Can School Redesign Project, the Kansas State Department of Education (KSDE) announced Tuesday, April 17, 2018. KSDE in February 2018 began accepting applications for the Gemini II Project and the districts were announced April 17 during the Kansas State Board of Education meeting. In support of Kansas’ vision for education, KSDE launched the Kansans Can School Redesign Project in August 2017. Twenty-nine Kansas school districts applied for the project. Seven districts — each one representing one of the Mercury 7 astronauts — were selected. Remaining applicants had the opportunity to participate in the Gemini I Project. Andover Unified School District (USD) 385: Meadowlark Elementary, Robert Martin Elementary, Cottonwood Elementary and Andover Central Middle. Caldwell USD 360: Caldwell Elementary and Caldwell Secondary. Cedar Vale USD 285: Cedar Vale Elementary and Cedar Vale Memorial High. Clay County USD 379: Garfield Elementary, Wakefield Elementary, Clay Center Community Middle, Clay Center Community High and Wakefield High. Fredonia USD 484: Lincoln Elementary and Fredonia Junior/Senior High. Halstead-Bentley USD 440: Bentley Primary, Halstead Middle and Halstead High. Haven USD 312: Haven Grade School, Yoder Charter School, Haven Middle and Haven High. Haviland USD 474: Haviland Grade School and Haviland Junior High. Lakin USD 215: Lakin Grade School and Lakin High. Little River-Windom USD 444: Windom Elementary and Little River Junior/Senior High. Lyons USD 405: Central Elementary and Lyons High. Neodesha USD 461: North Lawn Elementary, Heller Elementary and Neodesha Middle/High. Osawatomie USD 367: Swenson Early Childhood Education Center (PreK-K), Trojan Elementary (1-5) and Osawatomie Middle. Peabody-Burns USD 398: Peabody-Burns Elementary and Peabody-Burns Middle/High. Southern Lyon USD 252: Neosho Rapids Elementary and Hartford Junior-Senior High. Stafford USD 349: Stafford Elementary and Stafford Middle/High. Whitewater-Remington USD 206: Remington Elementary and Remington Middle/High. Wichita USD 259: Cessna Elementary and Chester Lewis Academic Center. Winfield USD 465: Country View Elementary, Irving Elementary and Winfield Middle. All districts that applied for the Kansans Can School Redesign Project had to agree to redesign at least one elementary and one secondary school around the five outcomes established by the Kansas State Board of Education, the five elements identified as defining a successful high school graduate, and what Kansans said they want schools to provide students. They also had to have approval by their local school board with a public vote, faculty support with a vote of 80 percent, and support from KNEA or other professional organization. The districts had to be willing to launch a new school redesign in the 2019-2020 school year and be willing to serve as a demonstration site for other districts in Kansas to study, learn from and visit. The Kansas State Department of Education (KSDE) announced Tuesday, April 17, that USD 465 is one of 19 school districts from across the state selected to take part in Gemini II: The Space Walk Begins, which is the next round of the Kansans Can School Redesign Project. “USD 465 is excited to a part of the Kansans Can Gemini II school redesign project,” stated Winfield School District Superintendent, Dr. J.K. Campbell, "We believe in the vision of the redesign to improve outcomes for all students." to redesign at least one elementary and one secondary school around the five outcomes established by the Kansas State Board of Education, the five elements identified as defining a successful high school graduate, and what Kansans said they want schools to provide students. They also had to have approval by their local school board with a public vote, faculty support with a vote of 80 percent, and support from KNEA or other professional organization. USD 465 participating schools plan to launch a new school redesign in the 2019-2020 school year and will serve as a future demonstration site for other districts in Kansas to study, learn from and visit. To learn more about the Kansans Can School Redesign Project, visit http://www.ksde.org/Agency/Fiscal-and-Administrative-Services/Communications-and-Recognition-Programs/Vision-Kansans-Can/School-Redesign.